Wearable art and other pieces that GISS art students are showing at Mahon Hall through Friday. Gulf Islands Secondary School’s visual arts students have created an immersive and interactive art environment at Mahon Hall, where this week visitors can see the results of the creative process as explored by 65 different participants. Under the guidance of this semester’s teacher, Emily Goodden, students have delved not only into their studio process but into all aspects involved in creating a group exhibit. Their learning experience in the school’s art room has included zine making, silk-screen printing and button making as well as making wearable art out of found materials, ceramic mask-making and more traditional drawing and painting techniques. With the help of visiting artists and community mentors, they have also learned to create an exhibition space that draws in the viewer. Following the example of contemporary artists such as Colette Urban and Patrick Cruz, their strategies include laying paintings on the floor, staging an inviting environment using their test fabric as tenting, and displaying masks on rods for an uncanny eye-level view, to name a few. The show was produced in partnership with the Salt Spring Arts Council. Additional support came from artist Melissa Searcy, Richard Steel on exhibition installation, Sue Earle on beginner’s sewing, David Borrowman on photographing artworks and Jane MacKenzie as SSAC co-ordinator/liaison. 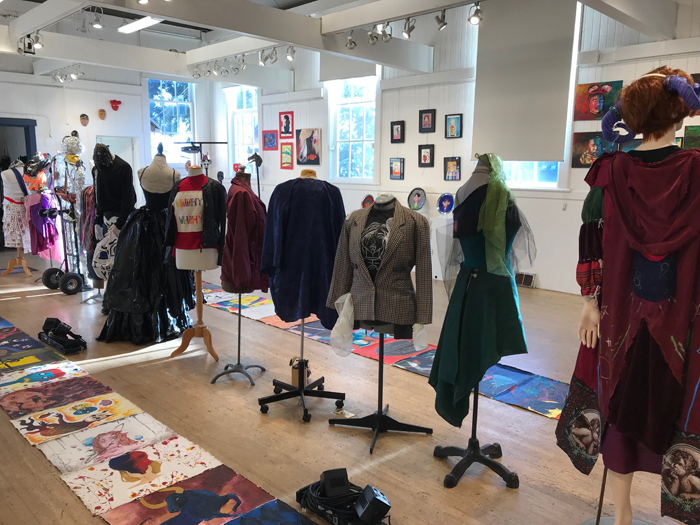 The show continues from 10 a.m. to 5 p.m. through Friday, Jan. 18 and ends with a closing party and fashion show featuring the wearable art, live music by students and food from 7 to 9:30 p.m.